I am settling back home from my visit to Squirrel Hill, the home of The Tree of Life*Or L’Simcha synagogue building in Pittsburgh, where the three communities New Light, Dor Hadash, and Tree of Life worshipped, and all lost members on October 27 of last year. A part of me will forever remain there. I poured my heart into my painting, The Tree of Life is Weeping, and the community, survivors, families of the slain, first responders, received with their selves in tears and gratitude. We touched by means of the painting. To have my artwork contribute to healing—my soul has reached its pinnacle. I will write another blog about what I learned. I experienced a whole kehillah grieving, but also tremendous energy from the world community aimed toward supporting, giving, healing: Tikkun Olam in the deepest sense of the Hebrew word: correcting and transforming evil energy into good. 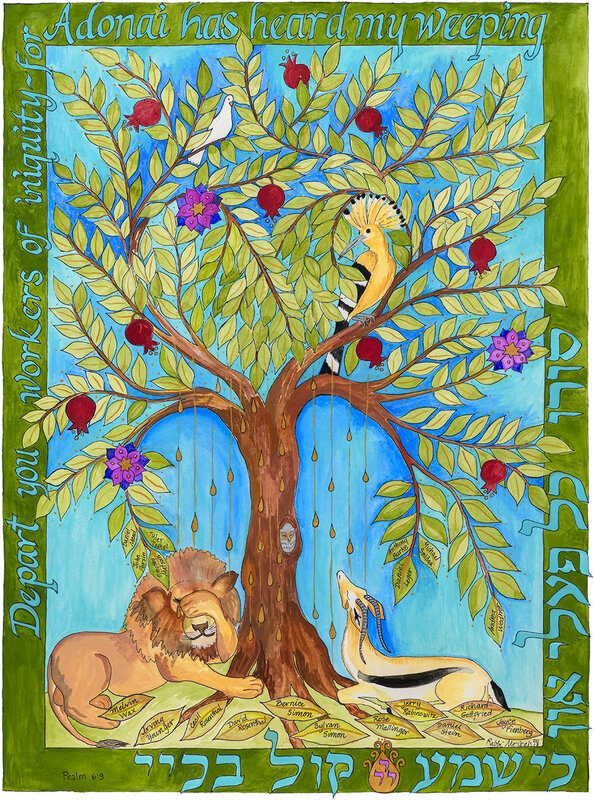 The Tree of Life, the universal symbol of miraculous diversity, harmony, peace and thriving is being nourished by many, in the face of this tragic assault. I have made a decision to offer giclee art prints of the painting for sale, and donate a portion of the proceeds to the Pittsburgh affiliate of the Hebrew Immigrant Aid Society or HIAS. Because the local community supported HIAS, it was targeted by the shooter.